We are seeking your support for our amicus brief in the Court of Appeals in Authors Guild v. Hathitrust. We believe that this case will have a dramatic effect on research in computer science to linguistics, history, literature and the digital humanities. In 2005, the Authors Guild, a lobby group with about 8,500 members including published authors, literary agents and lawyers, filed a class-action lawsuit claiming that Google’s library digitization project was a “massive copyright infringement”. 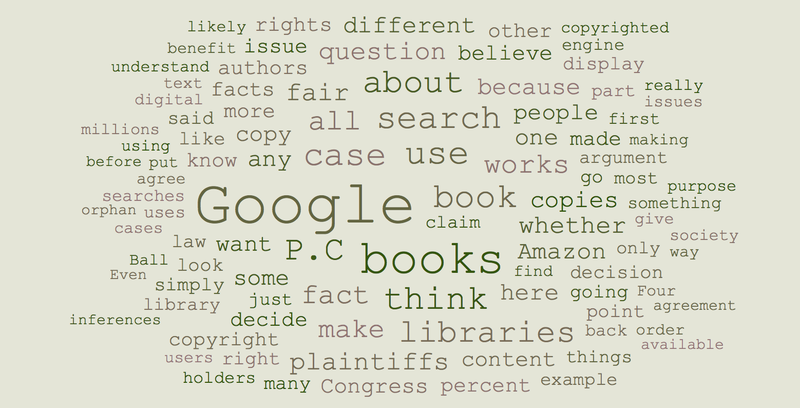 A settlement was proposed in that case in 2008, modified after strenuous objections from academics, other author groups and several foreign governments in 2009 and rejected by the court in 2011.In September 2011, in a separate case, the Authors Guild sued several universities and the HathiTrust for participating in Google’s book-scanning project. On July 7, 2012 the Association for Computers and the Humanities and more than 60 scholars from disciplines ranging from law and computer science to linguistics, history and literature, filed an amicus curiae brief in Authors Guild v HathiTrust on behalf of the digital humanities. On October 10, 2012, Judge Baer (Southern District of New York) ruled against the Authors Guild and their fellow plaintiffs and held that the library digitization for uses such as text-mining are “transformative” as that term of art is used in copyright law and, on balance, fair use (i.e., not copyright infringement). Judge Baer’s opinion cites our amicus brief, adopts one of our examples and appears to follow the basic structure of our legal argument. The Authors Guild is now appealing Judge Baer’s decision (on this and other grounds) and we would like your support in drafting a new brief for the U.S. Court of Appeals for the Second Circuit. Email matthewsag@gmail.com for a full draft, or download our previous effort (in related district court litigation) here. The final brief will be very similar to this. (1) You can let us know that you would like to join our brief (we need your name and affiliation e.g. Associate Professor, Jane Doe, Springfield University). We would also like to add a one line description of any aspect of your work that is relevant to the brief, e.g. ___ Grant to study ___ in ____ literary corpus or a relevant publication. Please note that ours is not the only amicus brief being filed in this case. Jennifer Urban (U.C. Berkeley) will also be filing a brief on arguing that the plaintiffs do not represent the interests of academic authors who comprise a large proportion of the class. YOU CAN’T SIGN BOTH. Please consider endorsing whichever brief speaks most closely to your concerns as an academic. We need your name etc., by June 3, 2013. Please email matthewsag@gmail.com or enter your details directly via this online tool. (2) You can point us toward easy to understand and compelling examples of the kind of research enabled by mass-digitization (we can’t include all your wonderful work, but we would like to understand it better). (3) You can send this link to other academics and Phd students. This the last of a series of posts commenting on the Authors Guild Appeal Brief (February 25, 2013) in Authors Guild v. Hathitrust. The views expressed on this site are purely my own. Has the Authors Guild Discovered a new fair use factor? In their Appeal Brief to the Second Circuit the plaintiffs have focused on a different line of argument, they now contend that the district court erred in failing to consider the express limitations of section 108 in its evaluation of fair use. In other words, because “library copying – is specifically addressed by another statute, Section 108, which therefore should guide the fair use analysis” (Authors Guild Ap. Br. Page 30). Cute. So every time Congress creates a public interest exception to copyright, that exception becomes a limitation on the balancing function of the fair use doctrine and thus, in effect, an expansion of the rights of copyright owners. I don’t buy it and I am pretty sure the court of appeals won’t either. Courts should consider a defendant’s substantial compliance with a specific exception in Title 17 when applying the fair use privilege. As the court assesses the first fair use factor, the purpose and character of the use, the court should give great weight to the defendant’s substantial compliance with the exception. The court should recognize that Congress determined that uses of similar purpose and character did not constitute infringement. See, Jonathan Band, The Impact of Substantial Compliance with Copyright Exceptions on Fair Use. The phantom tollbooth — Are workable markets for library digitization licenses just around the corner? This one of a series of posts concerning the Authors Guild v. Hathitrust case, specifically these posts take the form of commentary on the Authors Guild Appeal Brief (February 25, 2013). The views expressed on this site are purely my own. What if? … One of the interesting questions arising out of the Authors Guild suit against the HathiTrust is, what happens if the Authors Guild wins? Is there any way that library digitization programs could continue if the court ruled that any kind of digitization for any reason at all required permission from the copyright in advance? Naturally the plaintiffs and the defendants see this issue differently. The plaintiffs argue that copying without permission is wrong and that they will find a way to sell permission to people like the defendants so that digitization can continue. The defendants argue that copying without permission is permitted for specific reasons and that in this case there is no practical way to obtain the permissions the plaintiffs insist are required. Whether a market for digitization licenses (either in general or for educational access to orphan works in particular) would work in practice goes to the heart of the fourth fair use factor under Section 107 of the Copyright Act. The fourth fair use factor is “the effect of the use upon the potential market for or value of the copyrighted work.” The Authors Guild argues that “the District Court erred in failing to recognize the actual and potential harm to the Authors caused by the Libraries’ unlicensed mass digitization.” (Authors Guild Ap. Br. page 38). My guess is that the defendants will argue the exact opposite – that the district court was right to conclude that copyright owners were not likely to suffer any harm from the defendants library digitization project. The district court never got to the issue of the defendants’ orphan works project for reasons covered in previous posts, so the best the plaintiffs could hope for on that issue is a favorable remand from the Second Circuit. The question of market effect risks collapsing into tautology because every use by a defendant represents something that could, in theory, be licensed to the defendant if the court rules that it is not fair use. Courts try to avoid trap of circular reasoning by limiting market effect to effects that are (a) that are cognizable under copyright and (b) not too remote or speculative. “transformatively different from their original expressive purpose. In a case such as this, a copyright holder cannot prevent others from entering fair use markets merely by developing or licensing a market for parody, news reporting, educational or other transformative uses of its own creative work.” (citations and quotations omitted). In the Turnitin.com case the Fourth Circuit addressed claims of copyright infringement by students who objected to their papers being put through an automated plagiarism detection system. Before deciding whether an alleged commercial injury has or is likely to occur, a court has to figure out whether it is the kind of injury that copyright is supposed to prevent. Copyright law is not meant to prevent the harm of critical review or mockery, nor is it meant to prevent competition based on interoperable technology, nor is it meant to prevent computerized analysis of text. So, it is hard to see a copyright injury in this case if the only harm the plaintiffs can point to is that the defendants can now generate valuable data about library book (this is what you get of text-mining, computational analysis of text and search engines in general). Even if a court were to decide that in an ideal world digitization for non-expressive use should be an exclusive right of the copyright owner, that same court might still think that in the real world library digitization qualifies as a fair use because there is no functioning market for such rights. What do the plaintiffs need to show in terms of future harm? As I have already noted in a previous post, you can only take the photocopying cases so far in relation to library digitization. The court in Texaco was not dealing with an orphan works problem, nor was it dealing with a situation where literally millions of permissions would be required. What exactly is the Plaintiff’s evidence of “existing and emerging licensing opportunities”? No one can doubt that Professor Gervais believes this, but the evidence is far from indisputable. In the American context, Gervais points to two sets of voluntary organizations where the copyright owner has to opt in to collective management – performing rights organizations like ASCAP, BMI and SESAC and also the Copyright Clearance Center. These are opt-in organizations and it is hard to see how anything like the ASCAP model would work to address the orphan works issue. But that is really beside the point; neither of these examples shows that collective licensing schemes spontaneously emerge! All they show that collective licensing schemes can emerge when Congress deliberately creates them—in both cases as the quid pro quo for extending a new right to copyright holders. Likewise, the fact that a handful of Nordic countries have legislated for extended collective licensing for mass-digitization or that serious British academics have recommended the same does not prove much either. It might suggest that the U.S. government should consider this option, but it in no way shows that market based solutions to the transaction costs problems associated with library digitization will spring forth without direct action by Congress. “The ASA [Amended Settlement Agreement] exemplifies how a mass digitization licensing system could operate …” (Authors Guild Ap. Br. page 43). The ASA would have turned the Google Book search engine into the world’s largest book store – the orphan works problem was solved by making virtually everything for sale by default. The court rejected this settlement as going beyond the scope of a permissible class action, so it seems a bit perverse to argue that the defeat of the ASA offers any hope for a solution to the transaction costs problems inherent in digitizing old library books. How would a market for library digitization licenses actually work? This might work in some limited fashion for new works, but there is nothing in the Gervais report that explains how the CCC or some equivalent organization would be able to deal with the unclear allocation of digital rights between authors and publishers or address the orphan works issues that plague older out of print works. If library digitization for non-expressive uses or to meet the needs of the print-disabled requires a license, that is not a license most publishers will have the authority to give. We know from the Georgia State Copyright case (Cambridge University Press et al. v. Becker et al. 863 F. Supp. 2d 1190 – Dist. Court, ND Georgia, 2012) that only a small percentage of the works that are available through the CCC’s academic permission system are currently licensed for electronic distribution. In general the figure is about 12%, in the GSU case specifically digital licenses were available in only 44 of the 75 claimed instances of infringement – those 75 claims were hand-picked by publishers as their best evidence of infringement. In 2001 a federal court in the Southern District of New York ruled that a widely used publishing contract between authors and publishers which granted publisher the rights to publish a work “in book form” did not include electronic rights to the book. Random House, Inc. v. Rosetta Books LLC, 150 F. Supp. 2d 613 (S.D.N.Y. 2001). Publishers now write better contracts (better for them), but for all but relatively recent works, publishers do not typically own the rights to most books in digital formats – those rights typically belong to individual authors. It is curious that Professor Gervais’ expert report does not address this most salient of facts. The fact the CCC licenses some books (which is what they mean by “the same general type of copyrighted content) for some uses does nothing to show that the CCC could license the millions of books at issue here for the purpose of library digitization. “The CCC has existing licenses with academic institutions like the Libraries that allow for the rights of thousands of works to be collectively negotiated.” (Authors Guild Ap. Br. page 42). “…there are existing mechanisms that would allow the Libraries to obtain licenses for thousands of works at once.’ (page 43). This is hardly persuasive when the problem of library digitization relates to millions, not thousands. Was there any other evidence to which the Authors Guild could have cited? In one of their submissions to the district court the plaintiffs stated that “defendants also permit the Infringed Books to be used for non-consumptive research, an emerging field that represents another potential licensing stream for orphans.” (Memorandum Of Law In Support Of Plaintiffs’ Motion For Summary Judgment, June 29, 2012, Page 28). “Question. You said you’re interested in licensing your book for non-consumptive research; is that correct? Question. Why have you not done that so far? Answer. Not all markets are as mature as others. And not every market is determined by the — in this case the owner of an intellectual property going out and seeking to create that market. Wishful thinking is a far cry from evidence. It seems to me, the plaintiffs in Authors Guild v. HathiTrust are asking the court to create a new and unprecedented right—to give copyright holders the right to control intermediate non-expressive uses—and to simply assume that an efficient market to allocate these new rights will spontaneously appear. It would be just as wrong to allow copyright holders to license non-expressive uses of copyrighted works as it would be to allow them to license quotation for the purpose of criticism and transformative copying for the purpose of parody. You can’t just wish a new legal right into existence by establishing a set of tollbooths to collect on it. And in this case the tollbooths are just props from a Potemkin village. The ‘injury’ the plaintiffs assert strikes me as both speculative and beyond the scope of their statutory entitlements. They must be, the Authors Guild keeps saying it. The first thing to notice about the above quote is that the grounding assertion about the “authors’ property” is a little off base. The actual physical books were purchased by the defendants at a cost of hundreds of millions of dollars. It is convenient for the Authors Guild to overlook this fact, but in the most literal (but not the literary) sense, the books are the property of the libraries. Assuming, as I believe and the district court held, the defendants are entitled to scan their paper collections to enable disabled access, text-mining, computational analysis, and full-text searching, then there is no sense in which the copies so made are the property of the copyright owners. Of course, other uses of the digitized corpus might be infringing, but no more so than placing a book on a library shelf exposes it to certain acts of piracy. The ‘digital is dangerous’ argument exposes a tension in the Authors Guild’s legal argument. The Guild argues that plaintiff approved digitization will indeed take place following the spontaneous appearance of collective licensing organizations to manage these new rights (more on this in a future post); and yet, the Guild also argues that digitization will lead inexorably to massive piracy, which suggests that they would not approve digitization under any terms. Can these both be true? The inherent dangers of digitized collections have been massively over-hyped. (See, I said it twice, so it must be true.) Yes, as e-book readers become more and more widely used, there is a risk that pirate copies will substitute for legitimate sales. But this risk is entirely independent of library digitization. It is not just that it is usually bad policy to restrict A’s freedom because based on the hypothetical illegal acts by B later down the track. The real issue is that library digitization is totally irrelevant to e-book piracy – works of commercial value for which sales could be lost are already available in digital form on scofflaw file sharing websites. Run a search for “bittorrent harry potter book” on Google and you will see what I mean. Prohibiting universities from digitizing library books to advance the state of human knowledge will do nothing to stem the problem of online piracy, except perhaps giving people one more reason to reject the legitimacy of copyright law altogether. The Authors Guild argues even if the defendants’ security practices are in fact adequate, that a fair use ruling in favor of the universities would “encourage far less sophisticated providers to digitize, copy, store and make similar uses of books.” (Authors Guild Ap. Br. Page 40) This appears to fall well short of establishing the likelihood of any harm cognizable under copyright law. Mass digitization is a resource intensive undertaking, the public and private institutions that undertake it will no doubt be mindful of their tort liability for any failure to take standard precautions. The Authors Guild Appeal Brief contains an interesting argument that is hard to summarize with perfect fidelity because it appears in so many places throughout the document (illustrations to follow). Essentially the plaintiffs now appear to argue that even if some copying would be allowed for certain library digitization purposes, the defendants created a too many copies and that these copies, or their retention, exceed the parameters of any fair use claim. However it also appears on pages 8, 9-10, 12, 18, 30, 31, 32, 33, 36, 37 and 38. It entirely plausible that a plaintiff might look at a defendant who has made lots and lots of copies and argue that the very multiplicity of the copying is evidence that the real purpose was not the transformative use claimed, but some other use. For example, if Borders (1971-2011) had scanned its whole inventory and made 60,000 copies of the collection in dvd bundles, we might have begun to suspect they were planning on selling them. However, in the context of the library digitization being litigated in Authors Guild v. HathiTrust, there is no similar mystery about the extent of copying. The libraries maintain the original scan images because those images are needed to quality-check the OCR (optical character recognition) text versions. Those versions are also needed so that the collection can be re-digitizes when, inevitably, someone invents a smarter OCR program that is less prone to error. A biologist would not throw out an original specimen after taking their initial notes; a social scientist would not delete her original data after running her initial set of regressions. It would be somewhere between reckless and crazy to throw out the original scans. The same applies to the OCR-text files. It might be true that once you create a search index you don’t need the original text files to actually implement search. But as anyone with any experience in software development or working with data will tell you, there are always new and better ways to process information. It would be hubris, almost a crime against knowledge, to pretend that search indexing or optical character recognition in 2013 are a good as they will ever be. The Authors Guild Appeal Brief appears (to me) to be deliberately obtuse when it says “… even if this Court were to hold that HathiTrust in its current configuration satisfies these criteria, the Libraries still have not demonstrated their need to retain the digital image files in order to facilitate access to the print-disabled, as the assistive technology uses text files to convert the text from the book into speech.” (Authors Guild Ap. Br. page 38). Does the Authors Guild seriously intend that the print-disabled should be held hostage to state of the art in OCR and text-to-speech as of 2013? Any library digitization exercise should generate a handful of copies per book – you have to keep the original image and OCR files safe; you have to duplicate them so people can examine them; you have to store everything in multiple locations in case of flood, fire, terrorist attack or simple human error, and if scientists are regularly testing new equations against the original data you might need to mirror some of that data to increase the speed of the network. There is no reason why the universities should treat these digitized files any more cavalierly than Facebook treats the 267 photos of my dog I have posted to the social network.